Mel Brooks joined the Army when he was 17, became a combat engineer, where one of his tasks was defusing landmines. Brooks fought at the Battle of the Bulge. After the war, Brooks did stand-up comedy on the "Borscht Belt", resorts in the Catskill mountains. When the audience was not laughing enough, Brooks was known to run off stage and jump in the swimming pool, fully clothed, then resume telling jokes sopping wet. That usually won the crowd over. 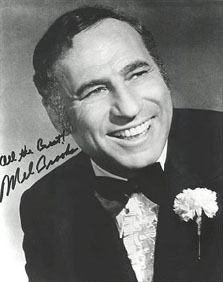 Brooks wrote for several of network television's earliest comedies and variety shows, including Sid Caesar's Your Show of Shows, where he met and meshed with Carl Reiner. Their kidding around led to the creation of their famous skits about a "2,000 year old man", and eventually a series of Brooks & Reiner comedy albums. Brooks also wrote for the stage in the 50s and 60s, beginning with comedy sketches for New Faces of 1952, a Broadway comedy revue that ran well into 1953. He wrote two musicals which had brief runs on Broadway, but primarily earned his living with TV work. With Buck Henry, Brooks co-created the delightful 60s Cold War spy spoof, Get Smart. Brooks then wrote and directed The Producers, a boundary-bursting film about swindlers trying to produce the most offensive Broadway play they can imagine -- a bouncy musical about Adolf Hitler. Starring Zero Mostel and Gene Wilder (in his first comedic role), it won Brooks an Oscar for best screenplay, and gave America the song "Springtime for Hitler". Now considered a classic, The Producers tanked at the box office. Hogan's Heroes had shown that America could laugh at Nazis, but apparently the nation wasn't yet ready to laugh at the Fuhrer. Adapting a Russian novel, Brooks wrote and directed The Twelve Chairs, with Ron Moody, Frank Langella, and Dom DeLuise. The film, about a Russian nobleman and a corrupt priest both searching for priceless jewels hidden in the titular chairs, is unlike almost any of Brooks' other films, in that it doesn't "spoof" anything, just tells a story and makes the audience laugh. But again, the audience was very, very small. It took several years for Brooks to convince a studio to underwrite his next film, Blazing Saddles with Cleavon Little and Gene Wilder, a tasteless but hilarious send-up of westerns. Then followed Young Frankenstein, Brooks' tribute to and satire of horror movies, with Wilder, Madeline Kahn, and Marty Feldman. Both movies were popular and critical hits, and Brooks was heralded as the only challenger to Woody Allen as the most hilarious auteur of the 1970s. His next film, Silent Movie, was admired more for its audacity than for its somewhat strained comedy. High Anxiety seemed overwrought and underfunny, and History of the World: Part I was unfunny enough to make Brooks fans worry. Spaceballs, Brooks' Star Wars parody, had its laughs and found its audience, but that film was followed by dreary comedies like Robin Hood: Men in Tights, wherein Brooks revisited (and stole gags from) his brief 1970's Robin Hood sit-com When Things Were Rotten. After Dracula: Dead and Loving It, a 1995 bomb with Brooks as the vampire's nemesis Dr. Van Helsing, Hollywood studios were chilly to Brooks. But with the advent of VCR and DVD technology, his 1968 The Producers had quietly become a fairly popular rental, and Brooks adapted the film to the stage. As a Broadway play starring Nathan Lane and Matthew Broderick, The Producers won 12 Tonys and has run for years. It was remade as a major motion picture in 2005, but with Brooks as neither director nor star. Brooks' production company, Brooksfilms, has made several noteworthy films, including David Lynch's The Elephant Man and David Cronenberg's The Fly, as well as My Favorite Year and 84 Charing Cross Road. His son Max is the author of The Zombie Survival Guide and World War Z: An Oral History of the Zombie War.